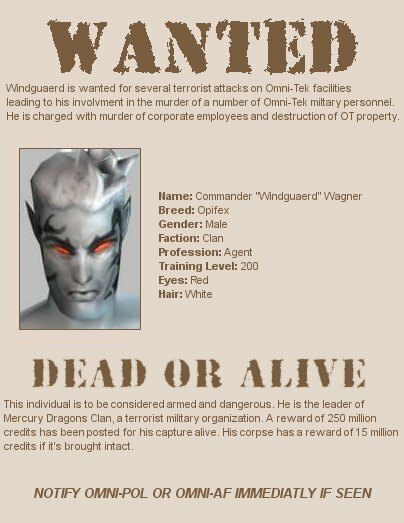 Earlier this morning, Omni-Pol and Omni-AF issued arrest warrants for Commander "Caid" Nottoris, Advisor of First Light Clan; a former CoT operative, Clan Leader Commander "Windguaerd" Wagner from Mercury Dragons Clan and Clan Leader Anthony "Cogs" Mcduff from Cerberus Clan. 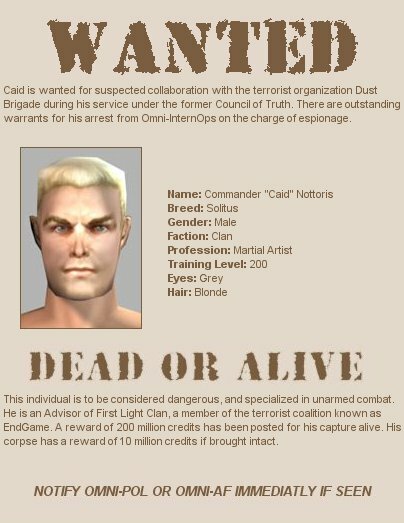 Holographic wanted posts have been displayed in the Trade and Entertainment districts and all outposts and bases. It does not surprise me that omni law enforcement departments would begin hunting down those who are trying to reform a new Council of Truth and bring a strong unity to the clans. Not even 48 hours have passed since the clan leaders meeting in Athen with Mr. Radiman that the corporation is cracking down on those who are trying to reform a new Council. 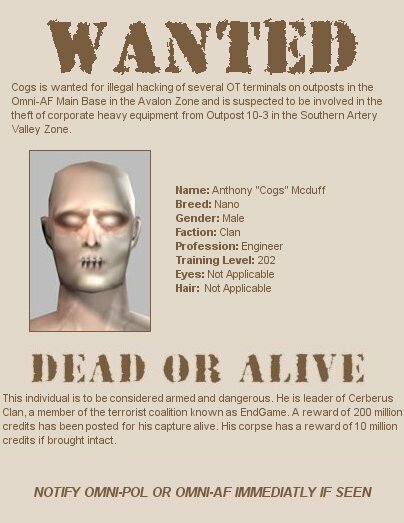 It is likely they see them as a threat; the last thing Omni-Tek wants is to face a united front in the form of a new CoT. If they were to have the backing of the majority of clans, then the ICC would have to recognize them as the new ruling body of the clans, and perhaps agree to negotiate a new peace treaty or accord to avoid the disruption of notum production on Rubi-Ka. ICC's motto is 'the notum must flow' and it will, unless the clans unite and stop the production and delivery of notum from our planet. How far will the corporate departments go to stop the clans from uniting? more warrants? more 'investigations' inside clan territory? more attacks on clan notum bases? assassinations? Only god knows what they will do, but I have a feeling the clans do not have their guard down; in any event, there will be repercussions to all actions from both sides. Hopefully a new Council of Truth will be formed, to clean up the mess that the original CoT left after their disappearance from Tir City.